New Perspectives on HTML and CSS: Comprehensive by Carey, Patrick M.
In addition to providing thorough coverage of HTML and XHTML, NEW PERSPECTIVES ON HTML AND XHTML does not require any prior knowledge on the subject and starts with the basics. Detailed explanations of key concepts and skills make even complex topics accessible to all level of learners. 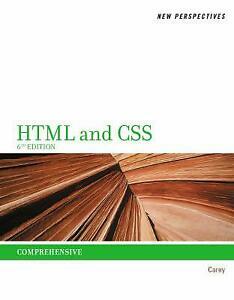 NEW PERSPECTIVES ON HTML AND CSS provides thorough instruction on building interactive Web sites from scratch. In addition to providing comprehensive coverage of HTML and CSS, this book does not require any prior knowledge on the subject and starts with the basics. Detailed explanations of key concepts and skills make even complex topics accessible to all level of learners. New Perspectives' signature case scenarios and case problems contextualize complex concepts. You can develop your problem solving skills by working through realistic exercises, which will help you retain the material and apply what you've learned in a professional environment. The 'New Perspectives' series provides a critical thinking, problem solving approach to learning and applying computer skills in a real environment. I have a love/hate relationship with this textbook. I love the information that is in the book but I absolutely hate the way that the book is set up in the book. I also own the HTML5/CSS3 Murach book and that book make more sense than this book. Bought it for a course in web programming I registered for. I'll not be able to get the course done during this summer. I didn't like the setup of the book. Even though it seems easy to follow. I'll try to do the book by myself later. Good book for learning how to start creating web pages. Purchased this book for a web design class. The book is easy to follow and informative. The book does not show you how to locate points for image maps which makes that process a little difficult.